At the age of 16 I fell off my bike, shattered the radius in my right hand, cracked my right knee cap and had a bone graph from my left hip. I was told I would NEVER be able to dance at the same level I had for the previous 12 years. But I proceeded to complete a BTEC in Sport and Exercise Science and A-Level Dance. From there I began my business with Zumba, teaching up to 25 hours of high intensity, interval, Latin American dance fitness. My passion for food, fitness, health and being a role model in my growing business grew more every day. Then at the age of 26 I fell off my Skate board…this is my story about what happened and how I dealt with life without work and exercise. It’s been almost a year since my last update, can you believe that? Well actually, 10 months. Gosh, so much has happened in that time. And next week I start another small recovering journey. But what has happened in the last 10 months?.. Winter…if you have any metal or old injuries, then you can connect with me, it’s a pretty painful time of year in the UK. The cold and damp makes your body ache. Let me try to describe..
You know when you have a headache, deep in your brain and even walking up and down the stairs or looking at someone hurts. That’s kinda what it’s like, like a deep aching pain.. It feels like the pin down the middle of my leg is frozen. Actually, after playing in the snow for an hour and your hands are so cold, they hurt…that’s it! I knew that would happen though, so I was prepared and ready and didn’t let it stop me teaching or doing my job. The one thing that I still can’t do, is run. 10 months ago, I started to run a little. Jog, walk, jog, walk. It’s what I would tell all new runners to do, which is why I trained that way. Except, trying to run my old pace from before the fall, even with a walk between, became impossible. It would start with cramp in my calf, that would then go numb as the cramp travelled up my leg, my glutes, my back and I would be forced to stop. It would be a relatively quick process. I went back to physio, back to strengthening my glutes, correcting posture and releasing the stress in my back. So at least I can run with my slightly slower clients and give them a good Personal Training session. I now go to Yoga and Pilates twice a week and can honestly say it had made a MASSIVE difference, to my strength, flexibility and the pain in my body. I am currently the most flexible I have ever been! WHICH IS BRILLIANT! I have always had a small irritating problem in my knee though, which would sometimes be an ache, sometimes a sharp pain. After a small investigation, follow up appointment and chat, it turns out that the screws just above my knee may be irritating my muscle during lunges, running, climbing stairs etc. So next week, Sept 1st 2015, I am having two screws removed. It should be a simple operation, of making an incision through the skin and muscle to the screws, and unscrewing them out. Then stitching me up again. Simple right? Then, why am I so nervous about it? 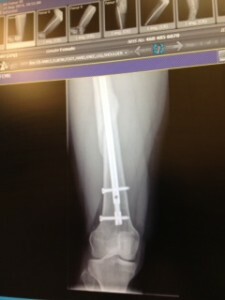 These are the 2 screws that are going to be removed, you can see that they protrude ever so slightly. I have been advised to take a weeks rest, then go back to normal gradually. I need to learn to listen to my body and take it easy. No rushing back to jumping around this time! I’ll let you know how it went, next week and how the recovery is going.